A traveler interested in exploring different cultures, history and art should visit this tiny country, the 82 percent of which is covered by mountains and that is situated between East and West and the name of which is Armenia!!! Immodestly, the Armenians consider themselves direct descendants of Noah. According to the Book of Genesis, Noah’s Ark came to rest on “the mountains of Ararat” after the Great Flood. 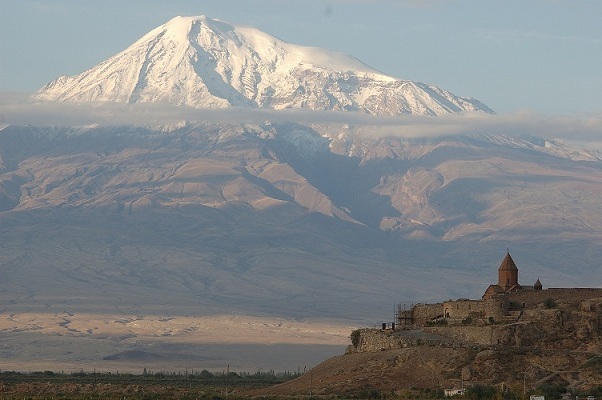 Ararat, located in the heart of Armenia Highland, was a Holy Mountain for the peoples of this ancient world. Many ancient scriptures have placed the Biblical Garden of Eden in the Land of Ararat. In the History Museum of Armenia you can see exhibits dating back to 1 million years ago that have been found in the modern territory of Armenia. Armenian people were adoring pagan gods and in favor of them pagan temples were built. Only after adopting Christianity in 301 the temples were destroyed and Christian churches were built in their places. Only the pagan temple of Garni still stands. Armenia is the World's first country that adopted Christianity as a state religion. Though Armenians in fact built plenty of fortresses, Christian monuments are clearly the most distinctive feature of the Armenian landscape. Armenia is frequently called an open-air museum. The original beauty of Armenian churches and monasteries can be explained by the harmony with the landscape. In the modern territory of Armenia you can see churches and monasteries dating back to the 4th C up to 21st C. The Mother Cathedral and other churches of Etchmiadzin, archaeological site Zvartnots, Monastic Complexes of Haghpat, Sanahin and Geghard as well, were inscribed on UNESCO’s World Heritage List. Khachkars (“cross-stones”) became one of the characteristic parts and the symbols of Armenian culture. The most common reason for erecting a khachkar was for votive reasons – for the salvation of the soul either a living or deceased person. They were also erected for other reasons, such as to commemorate a military victory, construction of a church or as a form of protection from natural disasters. Meanwhile the culture of the Armenian people is also expressed on khachkar. The Art of Armenian Cross Stones was inscribed on UNESCO's Representative List of the Intangible Cultural Heritage of Humanity. Another symbol of Armenia is duduk musical instrument. The roots of Armenian duduk music go back to the times of the Armenian king Tigran the Great (95-55 BC). It accompanies popular Armenian traditional songs and dances of the various regions and is played at events, such as weddings and funerals. Today, duduk craftsmen continue to create and experiment with different forms of duduks. Many Armenians consider the duduk as an instrument that most eloquently expresses warmth, joy and their history. Duduk and its music were inscribed on UNESCO's Representative List of the Intangible Cultural Heritage of Humanity. Matenadaran is another object of Armenians’ pride – it is one of the richest book-depositories in the world. Its collection of about 17.000 manuscripts includes almost all the areas of ancient and medieval Armenian culture and sciences - history, geography, grammar, philosophy, law, medicine, mathematics-cosmography, theory of calendar, alchemy-chemistry, translations, literature, chronology, art history, miniature, music and theatre, as well as manuscripts in Arabic, Persian, Greek, Syrian, Latin, Ethiopian, Indian, Japanese and others. In this center of cultural heritage many originals, lost in their mother languages and known only of their Armenian translations, have been saved from the loss. The history of the Matenadaran dates back to the creation of the Armenian alphabet in 405. This center of manuscripts has a history of centuries and that history continues till now as well. The Matenadaran was included in UNESCO's Memory of the World Program. Fruits and vegetables in Armenia are grown 1400-1800 meters above sea level in thin air and direct sunlight. Fertile land and exceptional spring waters give Armenian fruits and vegetables an unparalleled succulent taste. In addition, a range of microclimates and altitudes in the country allow for the production of unique and delicious fruits and berries. Fruit and vegetable processing is a well-developed industry, and canneries offer a large assortment of high quality tomato paste, pickles, compotes, natural fruit juices and nectars, preserves, jams, syrups and dried fruits.